Last month a new advisory was published on a vulnerability discovered in MacKeeper, a controversial software created by Ukrainian company ZeoBIT, now owned by Kromtech Alliance Corp.
As discovered by Braden Thomas, the flaw in MacKeeper's URL handler implementation allows arbitrary remote code execution when a user visits a specially crafted webpage. The first reports on this vulnerability suggested that no malicious MacKeeper URLs had been spotted in the wild yet. Well, not anymore. Since the proof-of-concept was published, it took just days for the first instances to be seen in the wild. The attack this post discusses can be carried out via a phishing email that contains malicious URL. 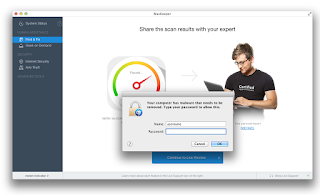 Once clicked, the users running MacKeeper will be presented with a dialog that suggests they are infected with malware, prompting them for a password to remove this. The actual reason is so that the malware could be executed with the admin rights. "Your computer has malware that needs to be removed"
Once the password is specified, the malware will be downloaded, saved as /Users/Shared/dufh, and executed. At this stage, the executable file dufh is a dropper. When run, it will dump an embedded executable and then launch it. The dropper will create a plist and update the LaunchAgents in order to enable an auto-start for the created executable ("<key>RunAtLoad</key>"). The embedded executable is a bot that allows remote access. The block of files specified between START_BLOCK_FILE and END_BLOCK_FILE tags will be downloaded/executed. Config parameters FILES, LOG, ID, CONFIG, OLD_CONFIG, and MAC are used to construct a 'message' that will be encrypted and submitted to the server. The SERVERS parameter contains an updated list of C&C servers. Config parameters TOKEN and EXTENSIONS are used to randomise URL parameters, as demonstrated below. The bot checks if it's connected to the Internet by accessing the Google page: http://www.google.com. If not, it keeps checking in a loop until the computer goes online. The data transferred over the network is encrypted with a random 4-byte XOR key. The key is generated by using Mersenne twister algorithm to produce a high quality random sequence of integers. The constructed blob is then base64-encoded and passed within the POST request, with a content type "application/x-www-form-urlencoded". The random 'extensions' specified within URL string and marked in red, such as .xml, .pdf, .htm, .zip, are picked up by the bot from the config parameter EXTENSIONS. The base64-encoded 'request' string, marked in blue, is an encrypted config parameter TOKEN ('h8sn3vq6kl'). It is encrypted in the same fashion as the data: (random 4-byte XOR key to encode the token, passed encoded with a fixed XOR key 0x0E150722). The only difference is that there is no CRC16 field present in the encoded chunk. The other 'path' parts of the URL are random. 0x7624c8e7 ^ 0x0E150722 = 0x7831CFC5. It's quite interesting to see how little time it took the attackers to weaponise a published proof-of-concept exploit code. One might wonder how the attackers know if the targeted users are running MacKeeper. In its press release, MacKeeper claimed that is has surpassed 20 million downloads worldwide. Hence, the attackers might simply be 'spraying' their targets with the phishing emails hoping that some of them will have MacKeeper installed, thus allowing the malware to be delivered to their computers and executed.